I want to shift the focus of my blog a bit. That is, I am going to dedicate the next four blog posts to a writing project that I have been developing in my Composition II courses for the past three terms. My motivation for doing comes out of an article that colleague of mine, Andrea Broomfield, posted to her FB profile. (Please forgive me for not having the actual title of the article. Andrea, if you read this post, would you mine helping me out?) Anyway, the gist of the piece was about ways teaching in the 21st century is changing. The part of the article that struck a cord with me was how teachers need to share, via, blogs, Tweets, etc., what they are doing in the classroom. Having taught for more than a decade now, I have benefited so much from those more experienced teachers who were willing to let me steal from them. So in this spirit, I would like to share a semester-long project that I have had some success with it for any other writing teacher who would like to use it or offer some feedback on how it could be improved. The idea for the project came out of multiple sources. Particularly, though, the project responds to a letter to the editor in The Chronicle of Higher Ed. In his letter, titled “Who Says Wikipedia Isn’t Trustworthy?”, Richard Morrill, a librarian at Lake-Sumter Community College, argues that instructors must change how they broach the topic of Wikipedia with their students. Instead of just hectoring students that Wikipedia is an unreliable source, Morrill writes, “Surely the thing that librarians and English instructors should be doing is giving students assignments to find and evaluate critically information in the Wikipedia?” I have a mixed response to Morrill’s claim. 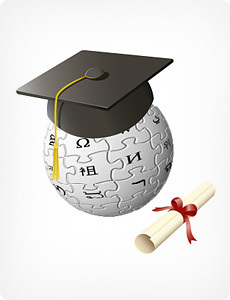 I absolutely agree that simply telling students that Wikipedia is unreliable does not allow for the independent critical thought that we should nurture in our students. However, I think Morrill brings a Web 1.0 mindset to a Web 2.0 site. Wikipedia cannot be treated simply as another traditional academic resource that positions users as a passive, receptive audience. Instead Wikipedia is a forum, a space in which those dedicated to a topic contribute their knowledge in a vigorous and, most of the time, thoughtful way. If anything, the articles are snapshots of rather long, involved debates/discussions among Wikipedians. Wikipedia is not a source for our students to cite but rather a scene of writing for our students to participate in! Now there’s a huge amount of scaffolding that accompanies every stage of the project that I will get into in subsequent posts about this project. However, I want to mention here how students respond to the feedback from other Wikipedians. One of the greatest frustrations that I have had as a writing professor is how students generally ignore my comments on their papers. While incorporating revision based on my feedback, students generally do not have a sense of urgency when it comes to my comments. Yet regarding publishing their writing on Wikipedia, my students perforce must engage with the other editors of the article through the “Talk” section. (While not all the feedback they receive is of the same quality, these interactions present an opportunity for my students talk about how to respond to comments made by other writers not within the classroom. That is, the comments made on their edits come from beyond the artificial community of our classroom and so take on greater weight for students.) Kuhne and Creel observed that through having their students edit Wikipedia articles, their roles as teachers became more facilitative, which is a transition I have experienced as well. I am going to include all handouts and supplemental readings I give my students, along with outlines for lesson plans. My hope is that anyone who wants to try this project out in their course will find my posts helpful and also may be offer some feedback on how I may be able to improve the project for my students. This entry was posted in Uncategorized and tagged Composition, teaching, Web 2.0, Wikipedia, Writing. Bookmark the permalink. Anthony, I’m really looking forward to hearing more about this project! I’m especially interested in how you have students compare the Wiki article they choose to non-Wiki sources. This semester, particularly, I’ve been struggling with convincing students of the value of searching beyond Google–this seems like an interesting way to help them understand the differences between Wiki, other internet sources, and other kinds of sources. I also think this might bring more importance to projects asking students to evaluate sources (like an annotated bibliography or research blog). I encounter the same problem too when it comes to having my students use search engines other than branded ones like Google. Despite taking them to our library for a presentation on the databases available to them as students, some still fall back on what they are familiar with. (One request I make of my students is that they must use a non-digital source in the project.) A benefit that I have noticed that comes out of the Wikipedia project is that my students are challenged by other Wikipedians on the credibility of their source. While I hate to say it, I think when this happens it becomes a great teaching moment to discuss the value of finding sources through means other than Google. We as writing teachers can lecture our students about the pitfalls of Google, but when their sources are questioned by someone else who deletes their edit, then our warnings becoming meaningful.